Jorge’s design is of the moment and timeless. It speaks of film as a transcendental art form, one that knows no barriers, whether they are linguistic, cultural, social or even racial. It also speaks of film as an art form that embraces other expressions such as theater, literature, dance and music. In that respect, Jorge’s design stands as a symbol of the International Latino Cultural Center’s and the Chicago Latino Film Festival’s core mission,” said Pepe Vargas, founder and executive director of the International Latino Cultural Center of Chicago. Jorge Pomareda graduated with a Master in Visual Design from the Scuola Politecnica di Design in Milan, Italy. His career in graphic design and advertising spans over 15 years, living and working in Latin America, Europe and the United States. 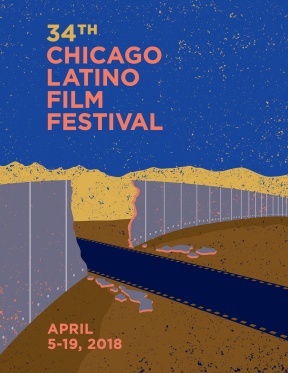 The 34th Chicago Latino Film Festival will take place April 5 – April 19 at the AMC River East 21, 322 E. Illinois St. The full program will be announced in mid-March.